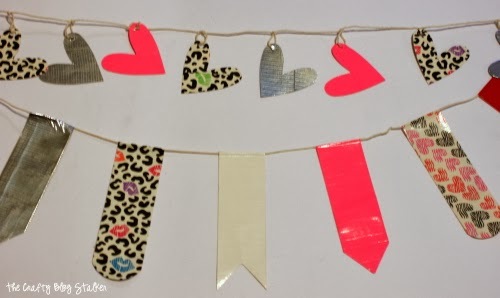 Create a Heart Banner using rolls of Duck Tape. Fun kids crafts that can also be used as party decor! An easy DIY craft tutorial idea. Isn’t Duck Tape the most awesome stuff? It can fix just about anything AND you can also craft with it and the possibilities are endless! The Duck Brand sent me several rolls to play with and I am thrilled with all of the fun colors and patterns they sent. There were a lot of ideas running through my mind, but I got the most excited about a banner. Have you ever seen a Duck Taper Banner before? I don’t I have. We are going to start with the pennants of the banner. 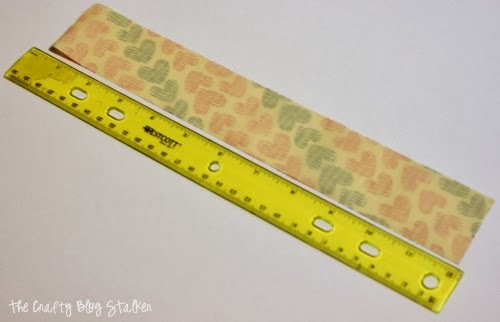 To begin, cut a strip of Duck Tape that is about 12 inches long. 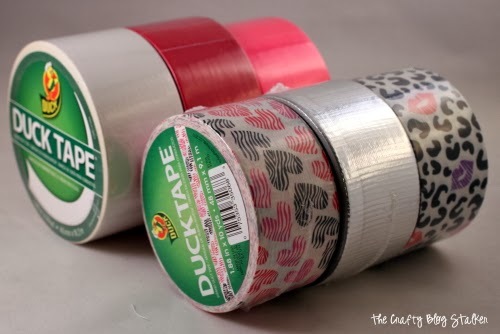 To begin, cut a strip of Duck Tape that is about 12 inches long. 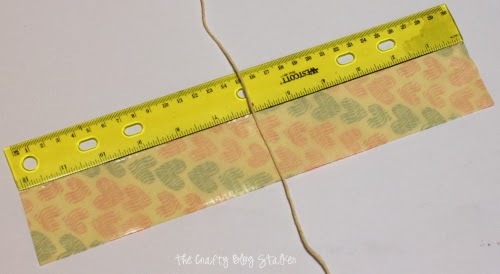 Line up the ruler along the side because you will lay the twine at the 6-inch mark of the strip of Duck Tape. Fold the strip in half with the twine at the very top. Repeat until you have the desired number of Duck Tape flags for the length of banner you are creating. Making sure to keep the space even between the flags. I wanted the flags to have several different ends. For the rounded end, use something close that is round as a template. 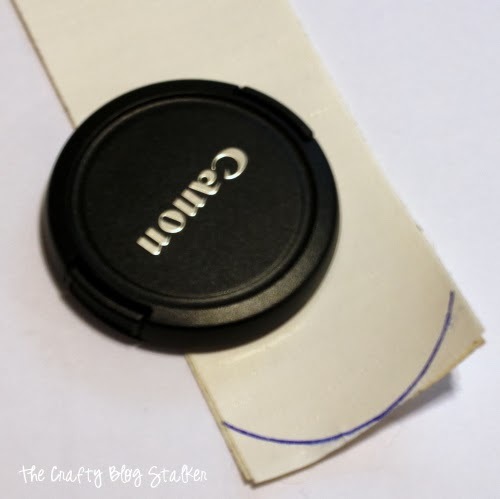 I used the lens cap for my camera and traced around it. Then trimmed with a pair of scissors. For the pointed end, mark the end of the flag one inch up from the center. Fold the flag in half and cut from the bottom corner to the center mark. For the dove tail, mark one inch up from the bottom on the side. Fold the flag in half and cut from the mark on the side to the bottom corner. The first part of the banner is complete. It’s cute but it’s not finished yet! Now we are going to make the strand of Duck Tape Hearts. Use the Big Shot and die to cut out as many hearts as needed for the length of the banner. Punch a hole in the corner of each heart. 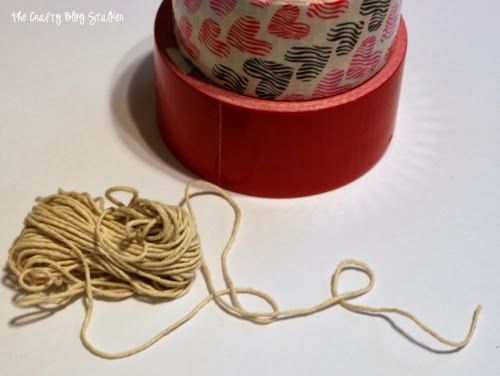 To hang the hearts, string the twine through the hole in the heart, tie a knot around a tube of lip stuff. This creates the perfect size loop for the heart to dangle from. Keep these evenly spaced as well. This is my favorite part of the banner. I really love how the dangly hearts looked. Put the two strands together and you can see the complete picture. In my home, I don’t have a cool mantel to hang them from, but I do have an entryway from the living room to the kitchen. 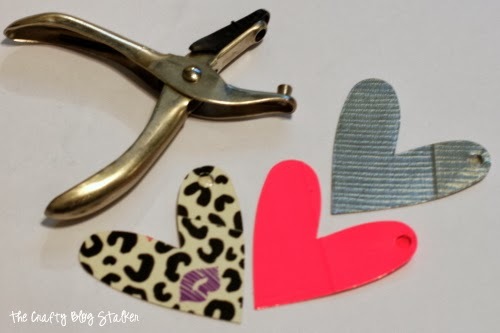 Would you make a Duck Tape Banner and use a different shape than a heart? Share and leave a comment below! 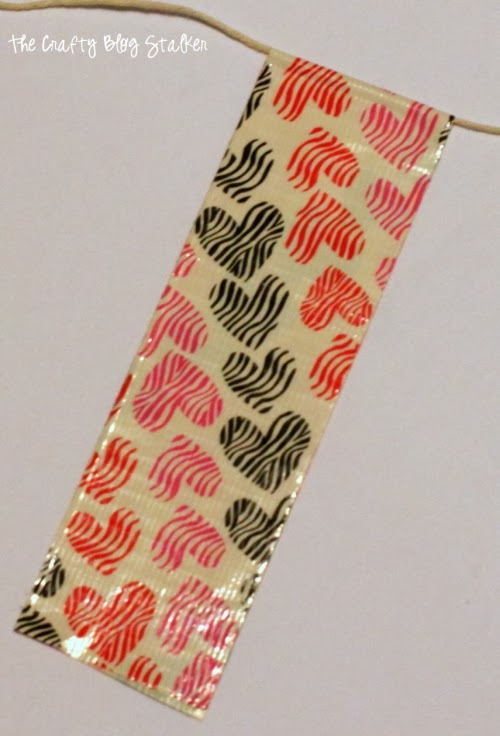 SAVE HOW TO MAKE A DUCK TAPE HEART BANNER TO YOUR FAVORITE DIY PINTEREST BOARD! Very cute! My kids are always using duck tape for something, I just used it to repair and freshen up the medicine cabinet in my powder room! This is awesome! I wish I knew about this when I needed a banner for my daughter’s birthday party! I’ll have to keep this in mind for the next time I need a crafty holiday decoration! Super Cute! Hope you stop by and share your stuff on My 2 Favorite Things on Thursday Link Party !! It is still going on! I would love to have you!